Us Brits have had a bummer of a deal when it comes to Wave 19. Originally planned for early November issues around shipping meant that we had to sit and watch YouTube vids or read the startrek.com previews to have any idea of what was coming. On the flip side they did arrive the same time as Wave 20 so there is a silver lining! Echoing Wave 16, we have another trio of ships coming from the central forces of the Federation, the Klingons and the Romulans. 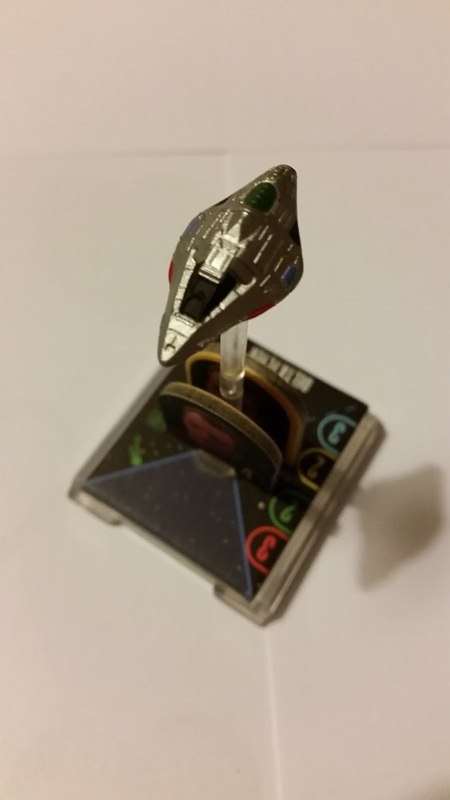 Let's kick off with a look at one of the smallest ships to date - and one I nearly lost in the bin, Voyager's super shuttle, Delta Flyer. It's the second retail shuttle release after the Quark's Treasure and carries all of the rules which affect these smaller craft. If you want to check out what they are, drop over to that review HERE for more on their new dynamics. Painted up in that odd silver colour that seems to be endowed on all the recent Federation ships (Thunderchild, Phoenix) but it does have some great hull detailing top and bottom which is great especially as it's so stupidly small. Not quite on scale with the Eaglemoss Voyager though if you're considering matching them up. So to the stats and she has some teeth with three attack dice, two for defence, a hull value of two and a shield value of two bringing the ship cost in at just 20 points. Note too that she's light of a Battle Station from the usual quartet of standard actions on Federation ships and comes with slots for an additional two crew, one weapon and one for tech. 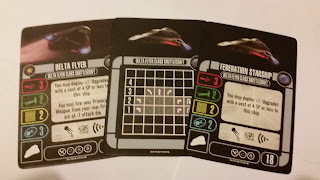 As for unique abilities, you can only attach weapon upgrades costing four or less (no photon or quantum torpedoes from the Defiant then...) and you can fire your primary weapon rearward but only rolling two attack dice. At least it's not going to incur disabling or dropping on a few Time Tokens. For movement she might not be super quick topping out at three on speed but at one and two there's a full range of turns including a 180 on both speeds, none of which will mean you're sticking Auxiliary Power Tokens on the table. Perhaps a little annoying is that the ship's usual pilot and commander, Tom Paris is relegated to second fiddle with Tuvok as your higher skilled officer and captain choice. Weighing in with a skill of five and a cost of three, he does let you stick an additional Tech upgrade onto the Delta Flyer and it will cost one point less to purchase. 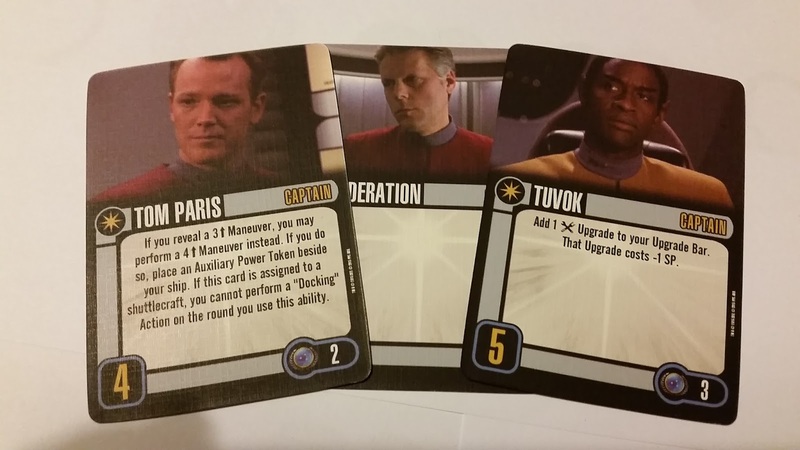 Tom does play more to his piloting ways with the potential to turn a forward three into a forward four move at the expense of an Auxiliary Power Token (reminder token included). Paris only costs two points but will have the advantage of speeding up your entry or exit from that combat situation. Neither captain has the option to field an Elite Action nor are there any included in this expansion so we're straight over to the crew and in the box you get a new B'Elanna Torres, Harry Kim and Seven of Nine. 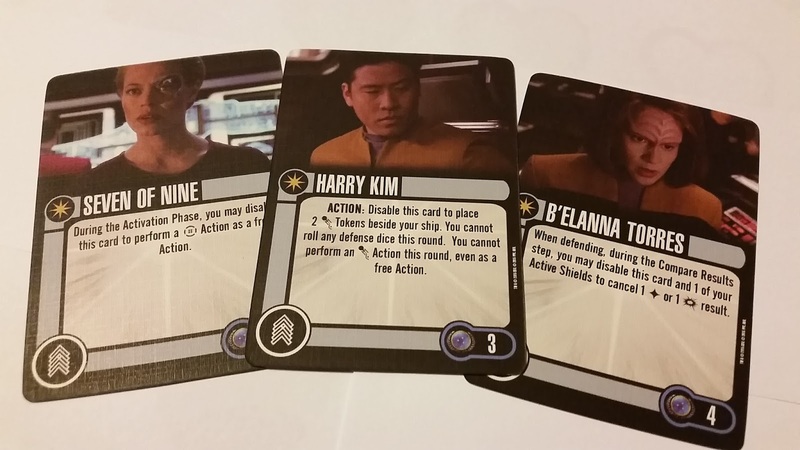 B'Elanna allows you to disable an active shield and her card to cancel a hit of either variety while Seven lets you perform a free Battle Station action during the Activation Phase. Both cost four squadron points and are offering good advantages to improve the measly defensive capabilities of the Delta Flyer. Frankly without some of these defensive options you'd be lucky to stay alive against a paper bag. Costing a point less but just as useful is Ensign Kim at three points. Creating more defensive options, you can add two Evade tokens to sit next to your ship BUT you can't defend or perform an Evade action that round (reminder token included). While for the Delta Flyer it guarantees a full result from the two dice you could have rolled, for anything larger it's only a respite. 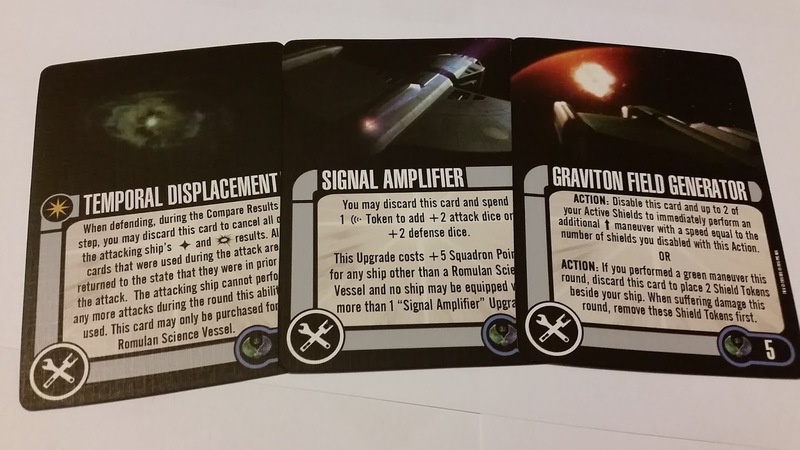 While the pack offers some good options in the way of defence - and one or two of those I might pinch for other ships - there are two cards which will vie to fill your lone weapon slot. 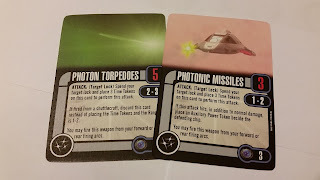 Costing three points you have Photonic Missiles. 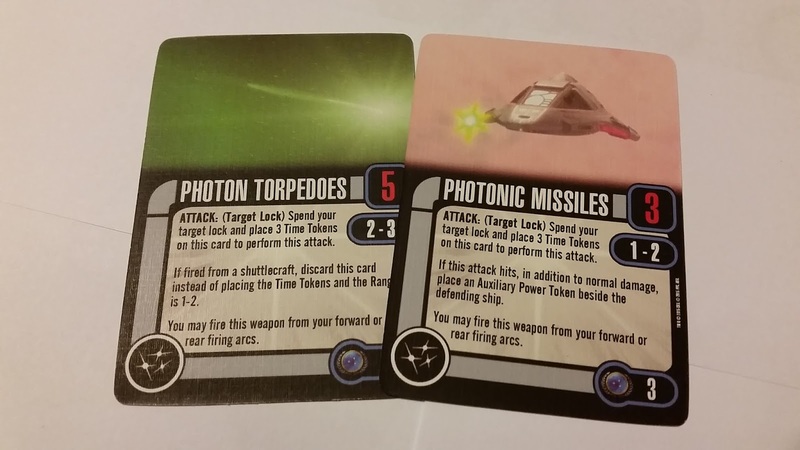 A poor man's torpedo, the missiles will cost a Target Lock and bring those Time Tokens into play. Operating at ranges one and two it'll be available from the rear and forward firing arcs (both active on the Delta Flyer) and uses three attack dice to land its hit. Cleverly though the hit will not only cause normal damage but, if successful, add an Auxiliary Power Token to your opponent's ship. Now that's useful isn't it? 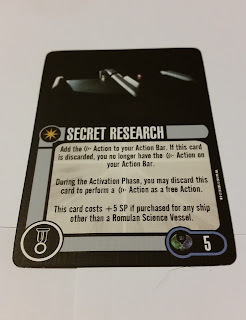 For such a small craft to pop an action restricting token into the game makes this card one to consider using especially due to the low cost for something reusable. 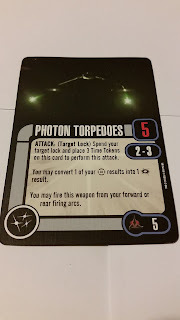 Also on the table is the standard Photon Torpedoes card but now including the legend that it's only a single use upgrade if fired from a shuttlecraft. That explains the slightly lower than usual four point cost although for one go it does up your attack potential from three to five dice. Finally for the Delta Flyer we have three Tech upgrades to suit all galactic budgets. For just two points but has to be discarded if used, we have Parametallic Hull Plating. Combined with Kim's double evade this is one that could elongate your life with the shuttlecraft and give you another damage dodge. It's a faction pure option though as using it on anything other than a Federation ship does cost three more points and you can only have one per ship. Upping to three points you can equip Immersion Shielding to up the shields by a point (the Flyer's would increase to four) and when you bump into an obstacle you get to re-roll the attack die and avoid additional, unnecessary damage. Again it costs three more points if on a non-Federation ship and it's a one-per-ship rule. I also don't see this being often-used since obstacles are usually very scenario-orientated. 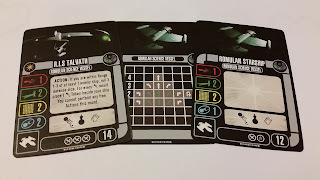 Finally the Borg inspired Unimatrix Shielding adds two points to your shields for a cost of five points but it has the crazy and rather useful ability to disable up to two of your shields to cancel the same number of damage or critical damage results - if you're being attacked by the Borg. This is a truly brilliant idea which keeps in line with the show and offers at least a little more resistance to the seemingly indestructible Borg faction. Perhaps one to consider only when you're facing them but an unusual addition nonetheless because it's so specific to one side. So to the mission and we're heading into fifth season Voyager territory with Extreme Risk. 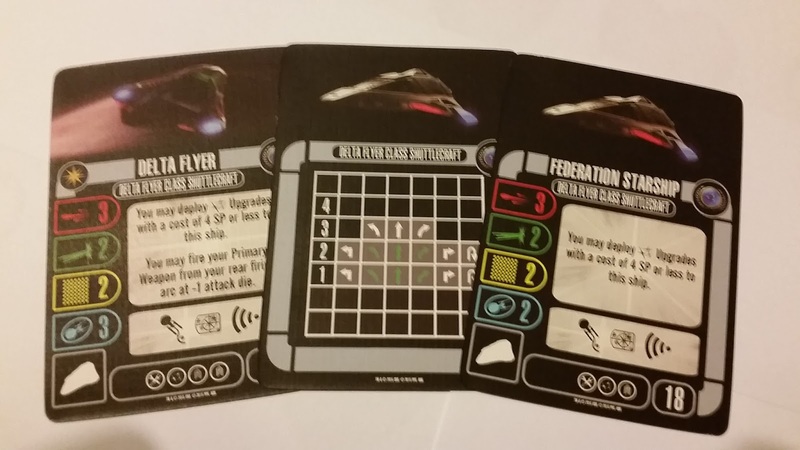 Two players get to split 80 points each between two ships with the Federation player fielding the Delta Flyer and another ship with a hull value of at least four. At the centre of the play area there's an objective token with a mission token atop it. The game is pretty straight forward with each team attempting to retrieve the mission token/probe but the atmosphere of a gas giant is a treacherous place which drastically affects the speed of your ship. Take care! As a ship this is one heavily defence-biased little gem of an expansion. The model is so-so but the pack itself certainly offers cards that can be punted out onto larger ships and give you more chance of lasting out a game - maybe even against those annoying cubes, spheres and octahedrons. Second up for Wave 19 is another Bird-of-Prey, this time from the worlds of Deep Space Nine and General Martok's flagship, the IKS Rotarran (note to Wizkids: can we have a Kruge Bird-of-Prey please?). Crisply painted up, these Birds are some of the best miniatures in the game and not just because they are painted in the right colours (cough Delta Flyer cough) but because the finish isn't messy and there are very distinctive markings across the hull surface. A beautiful finish on something of this scale so why can't they do it for all ships?! But what makes this different from all the other B'rel Class ships? Why would you want another? 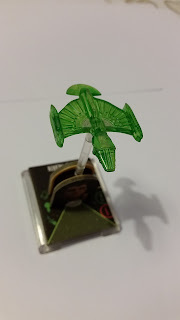 I have two myself (Chang's and the Ning'Tao from Wave 15) and a third does make a nice wing but did we need it? Possibly not however, the Rotarran isn't as combat-shy as the teeny Delta Flyer. With four attack, one defence, three hull and three shield points for starters it's standard Klingon Bird-of-Prey fare but with this one you can choose to use your Action and make a second manoeuvre at speeds one or two but it does cost you an attack and incurs the dreaded Auxiliary Power Token penalty. As for upgrades you can stick two Crew, a Tech and a Weapon on here. Martok is your sole "proper" captain option with the Rotarran with a skill of seven and a cost of four. He's my third Martok after the ones I acquired with the Negh'Var and the Ning'Tao. 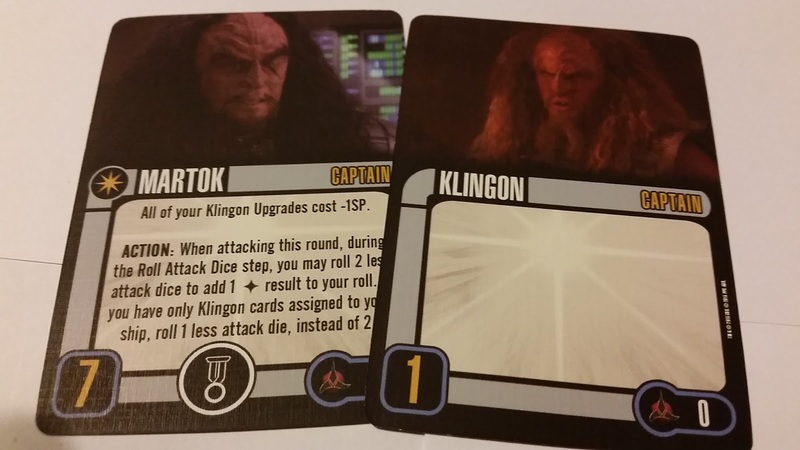 His advantages are two-fold; dropping the cost of all your Klingon upgrades by a point and also letting you roll two less attack dice for a guaranteed damage hit. Pleasantly and great for those of us who choose to go Faction Pure, you'll only lose one attack die instead of the two if you're only using Klingon cards. Mega advantage there and nice to see Wizkids catering to different styles of play - certainly something missing from the earlier rounds aside from the standard increase of costs if you're mixing and matching. Now when I say "proper" captain here it's not because I'm classing the generic Klingon captain in the pack but because the crew version of Worf can be utilised as your ship commander if something befalls the initial captain. He increases your Captain Skill by three anyway if selected as one of your crew choices but in command he attains a skill of five but can return to the crew if the captain recovers. Not bad for a card costing just two points. I'd have this in a heartbeat if I was facing a foe that could do a lot of damage to selected bits of your fleet. 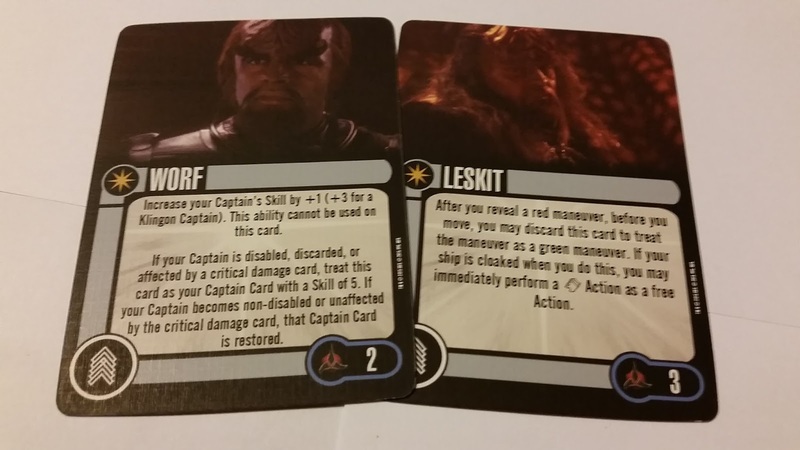 The Rotarran is a crew-heavy pack with another four crew cards available as well as this new Worf (might be my fifth Worf but I'll have to check as he pops up all over the place). 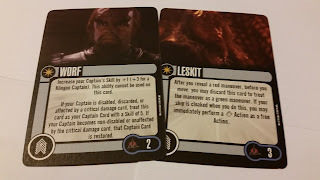 Taking lead from the Deep Space Nine episode, Soldiers of the Empire (good Klingon one that), we have Leskit. An older warrior in the episode, this crewman allows you to change a revealed red manoeuvre into a green and you can even perform a Sensor Echo if you're cloaked. Seems to be a trend in this expansion to have a few cards with two abilities rather than just one. Not complaining just an observation! 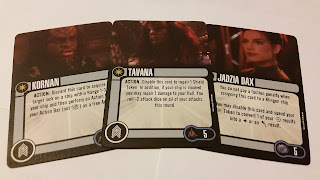 While Leskit costs three points and Worf two, Jadzia Dax, Kornan and Tavana are a little higher priced at five points each. 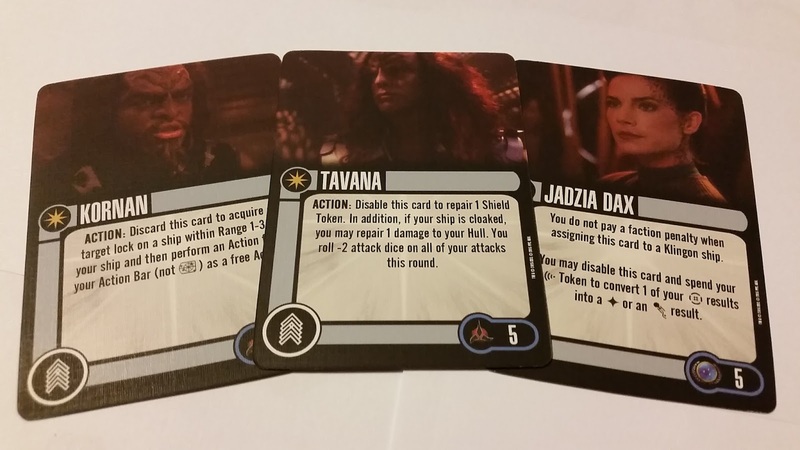 Dax is actually a Federation card but you won't be penalised if you use her on a Klingon ship and lets you spend a Scan token to turn a Battle Station into either a damage or Evade result. How nice to have something which helps take all that indecision out of a moment in the game? Sometimes you just don't know which way to turn to save your skin or take a pot shot and with this upgrade you can have some freedom to do either when the question arises. At first glance Kornan is a little more standard, but while you Target Lock you can also perform a free action from the Action Bar. This isn't rocket science but still opens you up to cautious defence or all-out attack dependent on the way your fight is going. Tavana on the other hand veers more in line with the early-episode Rotarran dogged with bad luck and seeking escape as she operates to repair a shield token and if you're cloaked she'll even repair hull damage. There is a cost however (shocker) because you can only attack with two less dice in the round she is used and disabled.. The Photon Torpedoes card is your only weapon upgrade included with the pack at the reguar cost of five points and using the Time Token reload feature. Only weapon addition it might be but for a ship with a Tech slot you don't get a single Tech card to use and that's not something we see very often with the expansions. Usually there's a card to cover all eventualities. Finally your captains have three new Elite Actions to select from starting at a cost of three points. Alert Status One is a discard to place a Battle Station token next to your ship. Yes, I did check and the Rotarran, as with other Klingon ships does not have Battle Stations on it's Action Bar. First time I've seen this being accommodated on a Klingon ship and again, showing a cool twist on the standard game in Wave 19. The Day is Ours! punches more into the offensive capabilities of the Bird-of-Prey allowing you to discard this four point card to add a Critical Damage result to your roll. A guaranteed result is always useful as I've had some games where the dice just failed to play (Independents versus Klingons actually) and a couple of certain rolls would have eased the pain. 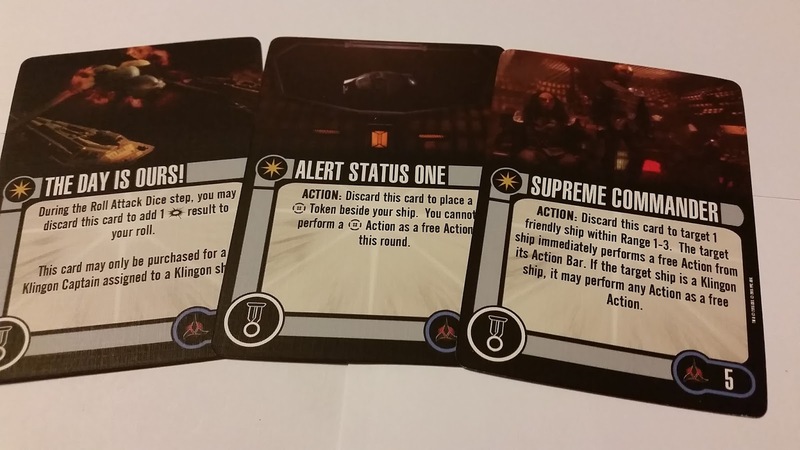 Supreme Commander is a five point discard that allows an allied ship at range one to three to perform a free action from it's Action Bar or any Action if it's a Klingon ship. Soldiers of the Empire once again appears in the included scenario which sees the Rotarran take on a Dominion ship to rescue the crew of the IKS B'Moth. You have three crew to rescue but will be unshielded and uncloaked when you do so which obviously makes you a sweet target for your opponent. A complete victory for the Rotarran will see the crew rescued and your Dominion adversary vanquished. Piece of cake. A very crew heavy pack with the Rotarran and one that focuses more on attack than any other aspects of the game. As a Klingon vessel that's no surprise but there are still a couple of choices if you do want to try and offer some form of defence to the ship. Last up for this delayed batch is the IRS Talvath. While as detailed on the plastic surface as the Rotarran it's in god-awful translucent green. Yuck. 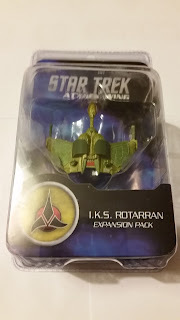 This is the second semi-see-through Romulan ship I've received and I'm not a big fan as they look a bit cheap and flimsy (also see the Vrax) - the earlier wave versions were much better. Additionally the Talvath was never actually seen on screen since it was at the other end of a micro-wormhole in the Alpha Quadrant. It's not the most offensive of craft in the game, even less than the Delta Flyer with only a single dice for attack, two for defence and two points for hull and shields. It can also only field three Tech upgrades so leading the battle won't be top of the agenda for this ship. As a unique action the Talvath allows you to roll three defence dice as long as you're within range one to three of an enemy vessel and to place an Evade token next to your ship for each Evade result you roll. Costing just 14 points the science vessel will fill a tiny support roll in your fleet but could leave you wanting if you're up against a stronger attacking force. 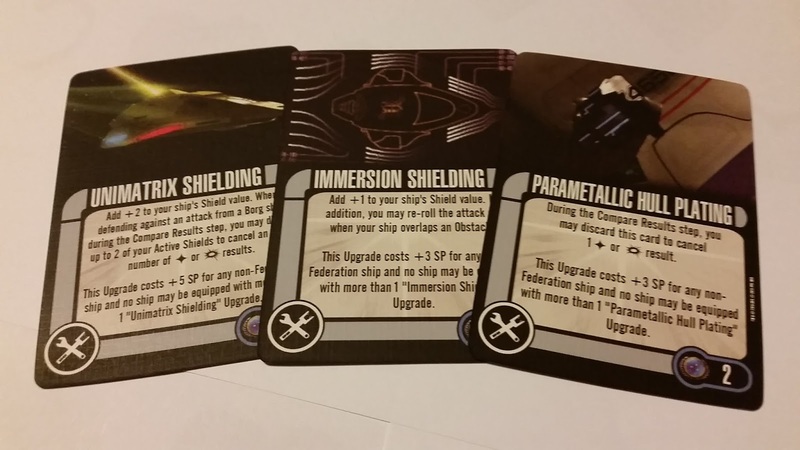 Oddly the generic version of the ship loses a shield point (down to just one) and loses two Tech upgrades but adds a crew upgrade for 12 points. There's a first. Usually you just lose bits! She is very manoeuvrable, hitting a top speed of four with all moves available at one and two plus that handy 180 turn at speed two. Three gives slight turns to the port and starboard while four only gives you a full ahead. Certainly handy for getting out of scrapes. Themed around the Voyager episode Eye of the Needle in which the Talvath was named but didn't actually appear(!) 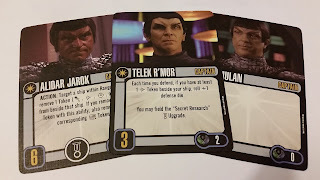 we have Vaughn Armstrong's Romulan (Doctor) Telek R'Mor as your first captain choice. He's a pretty cheap selection too costing just two points but with a low skill of three in the mix. Pushing the need to sure up your defences he adds an extra defence die to your Combat Phase as long as there's a Scan token by your ship. Comparing the ship's defences against some other larger ships, two defence die to start aren't a disadvantage but a third roll will help as attacking won't be your forte and the Talvath could well be the first main target of your opponents. R'Mor can also field the Secret Research Elite Action upgrade even though he doesn't bear the relevant emblem on his card. There's the Generic Captain too but Wizkids have also slipped in The Defector's Alidar Jarok (four point cost) for a second time since he actually appeared on the RIS Vo back in the early days of the game. Jarok can function either as a captain with a skill of six or add two points onto a captain by taking up residence as your Fleet Admiral. Either way he'll let you strip a token from a ship at range one (Evade, Scan, Battle Stations or Target Lock) which I can see being more effective on that fleet level with your ships spread across the board. That Elite Action we mentioned, Secret Research, is the only one included with the Talvath but it does add the Scan feature to your Action Bar to sit alongside Evade, Cloak and Sensor Echo. It seems you can keep it to use Scan as a normal action or choose to use Scan as a free action and therefore discard the ability. I'm not sure why you would want to throw it away mind. The generic science vessel version of the ship bears a crew upgrade and if you choose that and look through the expansion you will be a little befuddled since the Talvath only comes with six tech choices (yes, six!). Test Cylinder is your least expensive option at three points. Available only for Romulan Science Vessels you'll need to be uncloaked, unshielded and target a ship at range one. 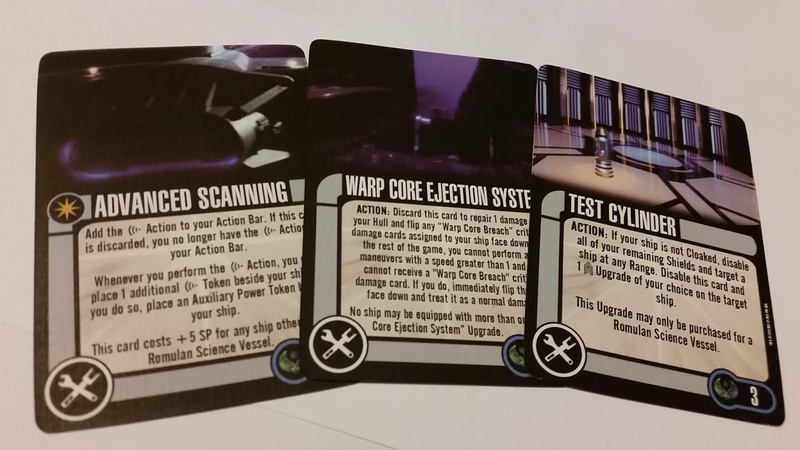 That's quite situational to then disable (not discard) the Test Cylinder card and one crew upgrade on the enemy vessel. It's not inspiring me the more I read it back to be honest since there are a lot better cards out there that will allow the same result. 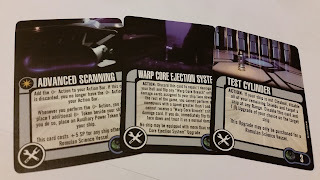 Four points will buy you Warp Core Ejection System to repair one Hull damage and flip a Warp Core Breach card. That's very dependent on getting that card so potentially a card for another day especially since it limits you to a speed of one but hey, you can't get a second Warp Core Breach so everything's good huh?! Really not a fan of this card as it's more of a hindrance than a bonus. 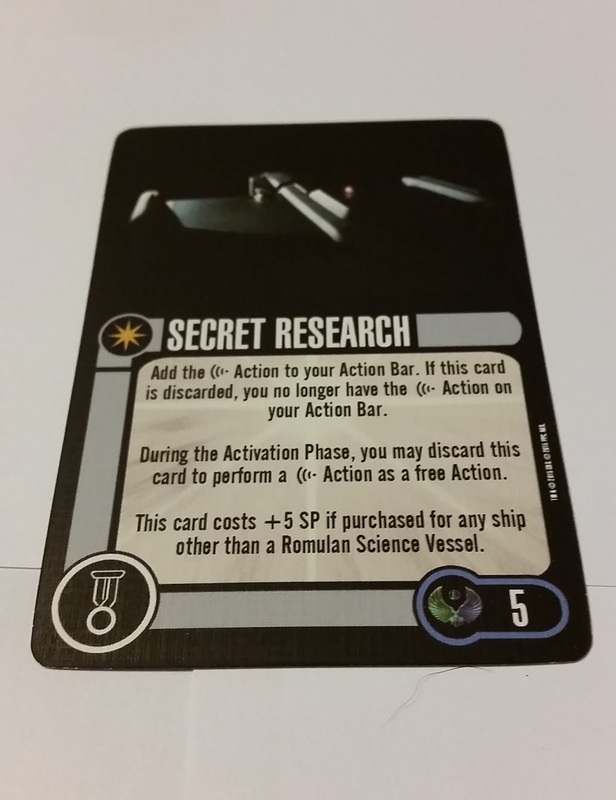 Advanced Scanning for five points adds Scan to your Action Bar as with Secret Research but this card lets you double your Scan tokens for the cost of an Auxiliary Power Token so your defences are a little better off. Another five pointer to consider is Temporal Displacement and it's probably the highlight of the pack allowing you to effectively cancel an entire attack and "reset" to a point before that attack was made. By that I mean that any cards used return to the state they were in before the attack began. It also stops your opponent from attacking again since their attack on you will have been made null and void. Really do love this because (while it is a discard) there's no negative impact on your ship and you can wait until the attack has been launched to see if you want to use it. I can absolutely see it's use on a smaller ship - the only type of ship it can be used on! 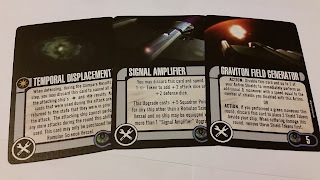 Signal Amplifier is a five point card which allows you to spend a Scan to bolster your attack or defence with an additional two dice. 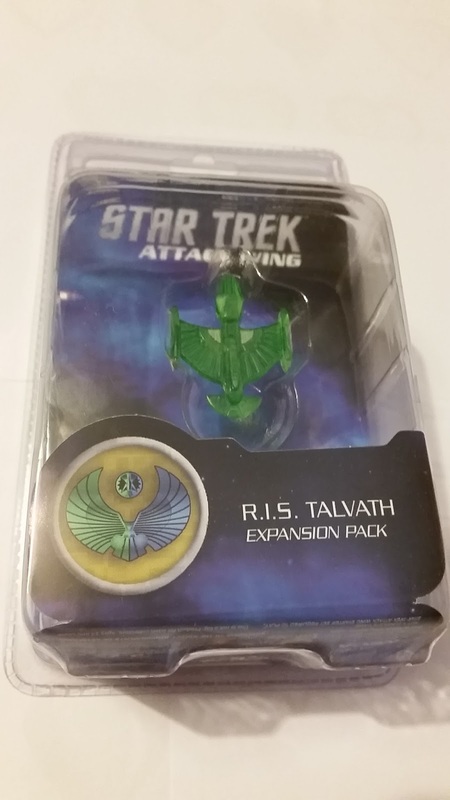 Shame you'll have to spend ten points to equip it on anything other than a Romulan Science Vessel but at least those players limited to retail releases will now have two to choose from on which to install this feature. Then, finally in this mass of Tech upgrades there's Graviton Field Generator. Yep, five point again but with two options. The first, a disable, lets you perform a forward manoeuvre BUT you also have to disable up to two of your active shields as well AND you can only go forward the same number as the amount of shields you disabled (phew). If you're more of a discarder you can perform a green manoeuvre and give yourself an extra two shield tokens. If you suffer damage these are the first to go but here's the interesting point - there's no specification that they can only be used on Romulan Science Vessels or that they only last for that turn or that they can only be added up to the number of your original/standard original shields total. I'd be interested in slapping this one onto something like the Valdore Class or the D'Deridex Warbirds for that extra edge. A standard two player set-up starts up Eye of the Needle with the Romulan player attempting to make contact with the Delta Quadrant through a micro-wormhole while not getting blown up. Simple and nothing too mind-blowing as a scenario. Please can we have something more imaginative in the next few waves?! The Wave 20 review isn't too far away but let's just reflect on 19. A classic selection of three major players with some great features especially on that Romulan Science Vessel. I'd go to say it's my highlight of this release over the Delta Flyer. That is nice but it's not quite as exciting as the Talvath which edges away from just straight attack/defence and utilises a lot more of the game tokens and features in different ways. Certainly I'd be using Scan and Evade tokens a lot more if I chose to go Romulan. Played with Wave 19? Good, bad, indifferent? What's your take on this recent gaming release?